Abraham Rash is a first-year law student at the McGill University Faculty of Law and an associate editor with the McGill Journal of Sustainable Development Law and Policy. He holds a Bachelor of Arts in History from North Carolina State University, a Master’s of Public Administration from the University of Vermont, and has previously worked in Burkina Faso for the United States Peace Corps, and as a Program Manager for the United States General Services Administration in Washington, DC, USA. Canadian fisheries law is descended directly from British fisheries law, which in principle remains largely unchanged since the signing of the Magna Charta. Under ancient British law, rights to fish the open ocean were outside the jurisdiction of any nation, while tidal water rights were public and vested in the Crown as parens patriae. This was distinct from the right to fish inland and non-tidal waters, which were generally the subject of property, required an owner and could not be vested in the public. By and large, this conceptual framework was adopted wholesale for the regulation of Canadian fisheries, albeit with the notable exceptions of the Great Lakes fisheries, the Saint Lawrence Seaway, and the Grand Banks and St. George’s Banks – all geographic features unknown to medieval England, and thus not envisioned in the inherent structure of British fisheries law. First passed in 1868, the Fisheries Act was one of the earliest laws passed in Canada following Confederation, and is among the oldest Canadian laws to still be in force. Initially intended as an omnibus repeal of pre-Confederation statutes regulating fishing and fisheries in the Province of Canada and the Province of New Brunswick, it has since been amended no fewer than 17 (soon to be 18) times, and has evolved in scope nearly as many times in its century and a half of existence. As originally passed, the Fisheries Act was limited in scope. To begin with, it only regulated waters within 3 nautical miles of shore – a historic norm that would not be changed until 1970, when it was briefly expanded to 12 nautical miles, before being pushed to 200 nautical miles just seven years later, where it remains today. Furthermore, the Act made no mention of environmental considerations and was instead intended purely to regulate the commercial fisheries of the young nation. Nor did this role change for nearly a century: from the first years of Confederation until well into the 1970s, the Fisheries Act was almost entirely industrial in scope, and paid no particular consideration to the welfare of the fish it regulated. However, following the collapse of the Great Lakes fisheries following the accidental introduction of the sea lamprey and alewife in the late 1950s, and the subsequent partial collapse of Atlantic cod stocks in the late 1970s, it became clear that a more proactive approach was necessary to protect the industry that was the lifeblood of much of the Maritime economies, and fundamental to the ancient lifestyles of many First Nations and Inuit peoples as well. Figure 1. 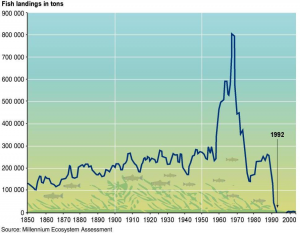 Collapse of Atlantic cod stocks off the East Coast of Newfoundland, 1978-1992. In response to the looming crisis, Parliament did what governments do everywhere: it made haste slowly. It wasn’t until 1985 that strong fish habitat protections were built into the law, and by then it was too late. Just six years after the new Act took effect, Atlantic cod stocks were near extinction levels, and the Canadian government was forced to take the drastic step of closing the fishery entirely. It was a decision that immediately put over 30,000 Canadians out of work, and the economic repercussions are still being felt today. It also set the stage for the modern use of the Fisheries Act, as a political hockey puck passed between liberal and conservative governments. Today, the Fisheries Act is the nation’s premier piece of environmental legislation. 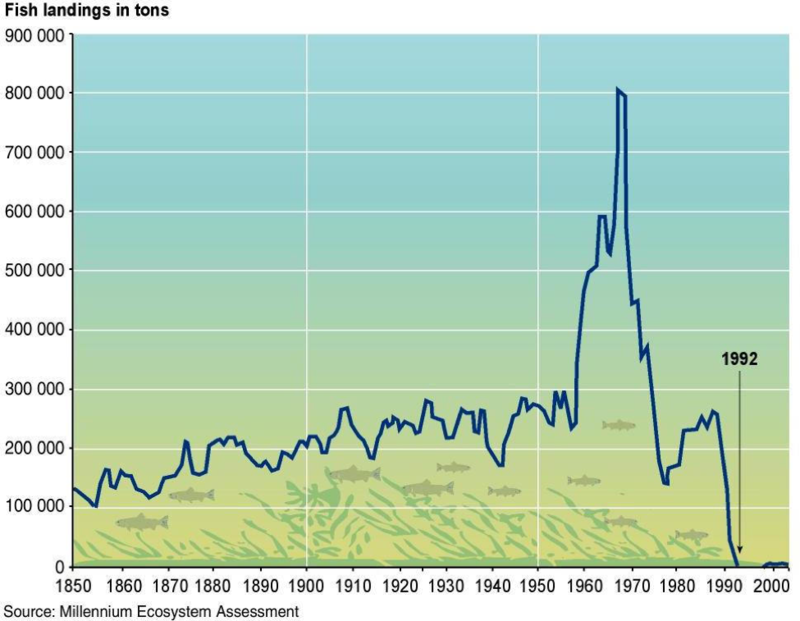 Between the competing pressures of the rapid decline of fishing stocks, the industrialization of commercial fishing in the aftermath of the Second World War, and the economic devastation wrought by the closure of the Atlantic cod fishery, the need to balance the requirements of both fish and fisherman is imperative. Thus, the Act has been revised time and again by successive incoming governments, usually with an eye towards shifting the balance between promoting economic opportunity and preventing environmental harm in accordance to the philosophy of whichever party currently holds the majority in Parliament. This year is no different. When Fisheries Minister Dominic LeBlanc announced the revised form of the Act two weeks ago, the Trudeau government was in effect announcing a shift in the balance from the strongly pro-industrial form of the Act promulgated by the Harper government, in favor of a more nuanced approach. In particular, the new Act will restore the prohibition on what is known as HADD: “the harmful alteration, disruption or destruction of fish habitat.” Long lauded by environmentalists as absolutely necessary to the preservation of stocks, and derided by those who make their living from the sea as an example of out-out-touch inlanders putting the wants of ideologues before the needs of communities, HADD is either fish-saving or job-killing, depending on who you talk to. Specifically, the Act will restore more than $280 million in funding cuts made by the Stephen Harper government to Fisheries and Oceans Canada, ban the capture of whales and dolphins, restore protective measures for fish and fish habitat and adopt more of a co-management approach with indigenous peoples. Crucially, it restores full protections for salmon, cod, lobster, and crab nurseries. However, it fails to address the question of commercial salmon farms, which are a lightning-rod issue among west coast aquaculturists, fishermen, and the First Nations that rely on wild salmon to support their traditional lifestyles. As described by the government, the goal of the new Fisheries Act is “To sustain fish production for the use and employment of present and future generations.” With the continued closure of the Great Lakes and major Atlantic fisheries, this brings the focus of the Act back to the more ancient waters originally conceived in British law: the tidal and near-shore waterways that make up the bulk of Canada’s remaining commercial fisheries. The hope is to promote jobs in those areas, while still fostering and encouraging conditions to aid in the gradual restoration of still-fragile cod stocks. Only time will tell whether it is successful or not. The full text of the new Fisheries Act can be accessed here. Published by MJSDL on March 16, 2018 at 6:22 pm under Uncategorized.